FASHION STYLE AND WE !! : Care for your feet this Monsoon!! Rains and shoes don't go well together! But what most of you need to know is that it is important to look playful, casual and fun when selecting footwear for monsoons. Feet are a vulnerable part of the body, due to repeated wetting and being in packed shoes for long time, fungal infections thrive! To avoid the athlete's feet,i bring to you some playful flip flops that will make you look trendy yet chic on a soaked day. 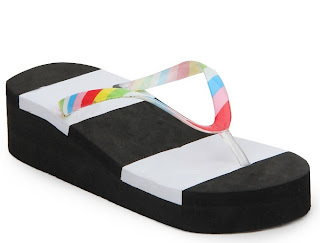 These classy Flip flops you can buy from Jabong.com. These quirky pair of flip flops are fun and add a dash of interest to your feet. Wear it with a nice pair of bright linen pants and let your fete do the talking! Just for Rs. 160/- Available on zovi.com. Hurry!! Follow the care tips, wear right footwear, and yes don't forget to take a splash in the rains!! !